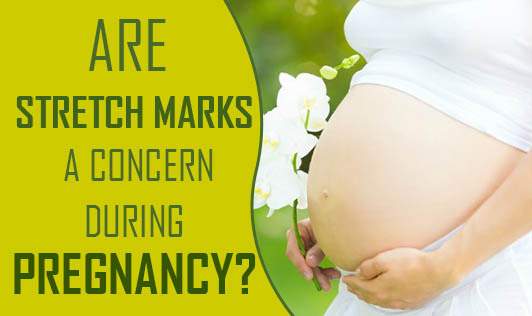 Are Stretch Marks A Concern During Pregnancy? Stretch marks are lines that usually develop on the abdomen, or other parts of the body like the buttocks, thighs, hips, and breasts. These stretch marks generally become more visible from the end of the second trimester of pregnancy. Causes for stretch marks: Stretch marks are caused by changes in the elastic supportive tissue that lies just beneath the skin. They start out pink, reddish brown, purple or dark brown, depending on the skin color. They later fade, although they never totally disappear. 1. You gain a lot of weight rapidly. 2. You are carrying multiples. 3. You are carrying a big baby. 4. You have excess amniotic fluid. Skin hydration: During pregnancy, your skin can become abnormally elongated, dry, itchy and easily irritated. So, drink lots of water, herbal tea, juice, etc and avoid too much of caffeine as these can reverse the process of hydration. Exercise: Working out will maintain your muscles by firming them up, and consequently your skin remains firm as well. Firm skin elongates naturally, without breaking up and may keep it rid of stretch marks. Moisturize the skin: A good moisturizer will maintain your skin with proper elasticity. Moisturizing creams, oils and lotions may aid in hydrating your skin and develop elastin and collagen. So far, there's no proof that any of the creams, lotions and oils that claim to prevent stretch marks actually work. Control your weight: Whether you are pregnant or not, it's always beneficial to maintain your weight in check, as sudden weight variation (gain or loss) is one of the main causes for stretch marks during pregnancy. Eat a healthy well balanced diet: Proper nutrition may help prevent stretch marks during pregnancy by providing your skin what it needs to strengthen the elastic fibers. Remember, the most critical factor that determines the answers to these questions is how healthy you are during your pregnancy - both physically and mentally!